This drill involves one pass and a one on one in tight space. It is a great drill for practicing breakout passes and 1 on 1 in a station based practice. It is designed for younger teams and can be used as a station because it only involves half of the zone. Line up the players as shown in the diagram. The drill starts by the coach dumping a puck off to the side of the net. The defensive player retrieves the puck and skates around the net. At the same time the offensive player skates low, opens up along the wall, and receives the pass from the defensive player. 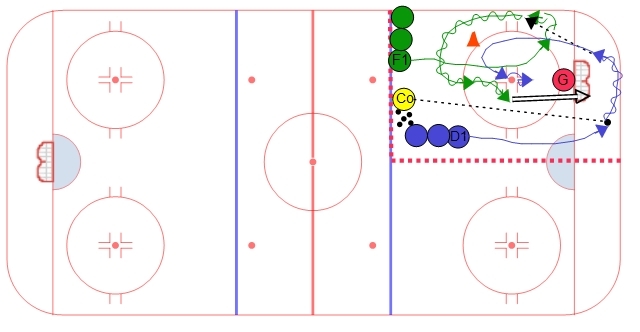 The offensive player then skates with the puck around the cone and attacks the defender in a one on one situation.